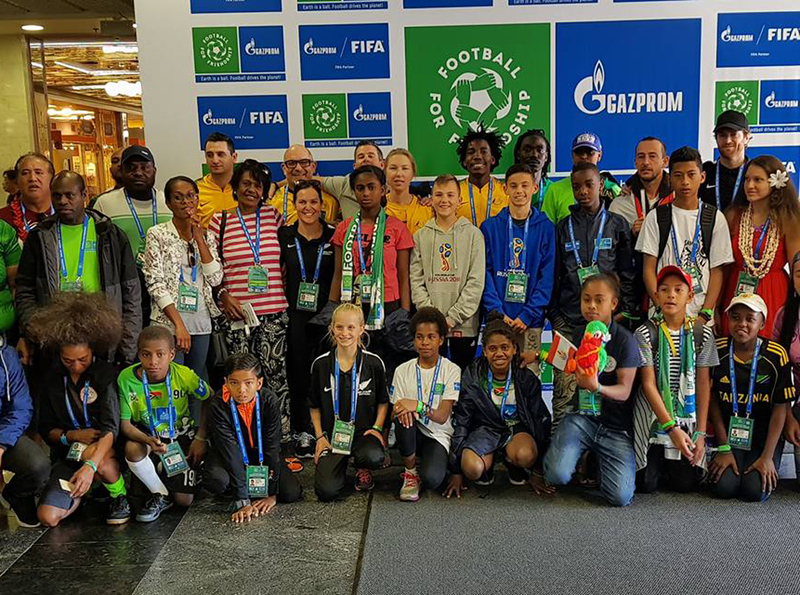 Promising football players and aspiring journalists from American Samoa, Cook Islands, Fiji, New Caledonia, New Zealand, Samoa, Solomon Islands, Tahiti, Tonga and Vanuatu have returned to their home countries as Football For Friendship Young Ambassadors after attending the 2018 Gazprom International Children’s Social Programme, Football For Friendship (F4F) in Moscow. In the lead up to the FIFA World Cup 2018™, the sixth Football For Friendship programme was attended by 1500 children and was covered by over 300 international media outlets to spread the values embodied by the beautiful game to the world. Now these kids will bring the values learned at this rapidly growing global social programme to their own countries in the name of friendship. On 12 June, the Football for Friendship World Championship was held at the Sapsan Arena, home of local professional club FC Kazanka Moscow. In total, 32 international teams of friendship were formed with each team named after rare animals on the verge of extinction to increase the interest of younger generations in preserving the world’s fauna. Team ‘Chimpanzee’ won the tournament and were presented with the Nine Values Cup, representing the nine values of the programme: friendship, equality, fairness, health, peace, devotion, victory, traditions and honour. To cap off the programme, all participants were invited to attend the opening match of the FIFA World Cup 2018™. The opportunity was brought to New Zealand and the South Pacific region by Football For Friendship’s global football partnership with Lengo Football Academy and its local partner, Reagan Milstein Foundation.